One of my favorite inspirations is Campy style. I love bright colors, big hair, and lycra. It is so fun to work vintage pieces into the wardrobe and update them with modern basics. It produces timeless style that is unique and unexpected. This week I want to talk about some of my favorite Camp icons. John Waters is a creative cinema genius. Throughout his film career he has created films that have a distinct style and point of view. John was raised in Baltimore, Maryland during the 1950s. His films reflect and then subvert the sense of innocence and idealism of the times. Mr. Waters early films were written, directed, and produced by him. We love visionaries that follow their passion! Although it is hard to choose, I would have to say that Hairspray is my favorite John Waters film. Not only does it cover the mod styles of the 1960s, including massive beehives, but the content of the film is also amazing! The film explores both female empowerment and the movement to end segregation. All of this plays out through songs and dances of the 60s. It is campy and fun! Music has also been a great inspiration for Campy style. 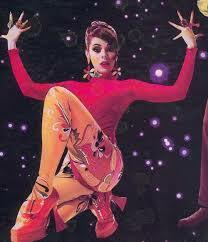 I love Lady Miss Kier, from the 90s band Deee-Lite. Deee-lite was a trio comprised on Lady Kier and two DJs, from Russia and Japan. They debuted in 1990, and were largely supported by the Lower East Side Drag Queen community. Their music attracted many followers, and transcended boundaries of race and gender, just like John Waters. Who is your favorite Campy icon?